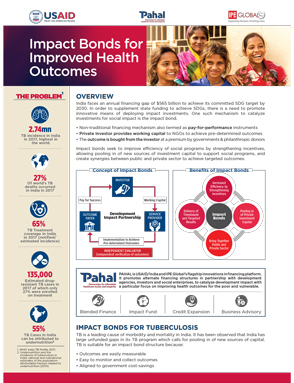 PAHAL is USAID/India and IPE Global’s flagship innovations in financing platform. It promotes alternate financing structures in partnership with development agencies, investors and social enterprises, to catalyze development impact with a particular focus on improving health outcomes for the poor and vulnerable. Impact bonds seek to improve efficiency of socila programmes by strengthening incentives,allowing pooilng in of new sources of investement capital to support social programs, and create synergies betweem public and private sector to achieve targeted outcomes.